The Dark Past of Special Prosecutor Robert Mueller — The Bulger Gang, Lockerbie, Anthrax… An Exceptional Failure All Round. Robert Mueller was assistant attorney general in the United States in 1991 when indictments were issued for the two Libyan suspects, Megrahi and Al-amin Khalifa Fimah. 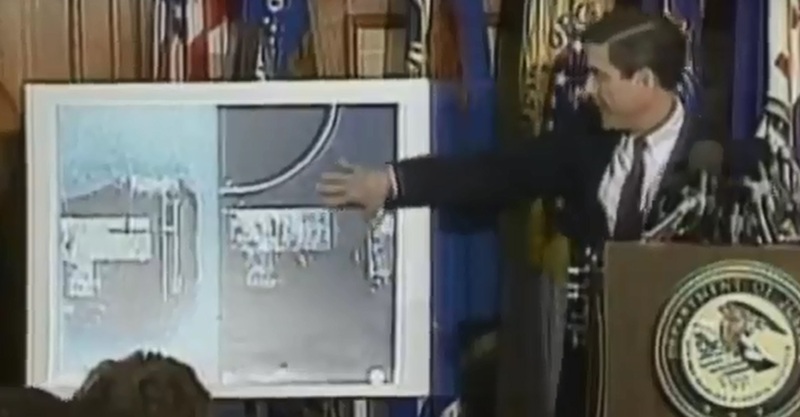 A young Mueller is explaining the importance of PT/35(b), a small fragment of a circuit timer that was allegedly found among the debris of Pan Am 103 near the town of Lockerbie. Today, we know that PT/35(b) is a forgery that was planted to blame Libya for the tragedy. Coleen Rowley is a retired FBI special agent and division legal counsel. In a May 2002 memo to then-FBI Director Robert Mueller, she exposed some of the FBI’s pre-9/11 failures. She was named one of TIME magazine’s “Persons of the Year” in 2002. Rowley seems to be one of the rare persons who remembers correctly Mueller’s ‘achievements’ over a very inglorious career. Long before he became FBI Director, serious questions existed about Mueller’s role as Acting U.S. Attorney in Boston in effectively enabling decades of corruption and covering up of the FBI’s illicit deals with mobster Whitey Bulger and other “top echelon” informants who committed numerous murders and crimes. When the truth was finally uncovered through intrepid investigative reporting and persistent, honest judges, U.S. taxpayers footed a $100 million court award to the four men framed for murders committed by (the FBI-operated) Bulger gang. Current media applause omits the fact that former FBI Director Mueller was the top official in charge of the Anthrax terror fiasco investigation into those 2001 murders, which targeted an innocent man (Steven Hatfill) whose lawsuit eventually forced the FBI to pay $5 million in compensation. Robert Mueller was assistant attorney general in the United States in 1991 when indictments were issued for the two Libyan suspects, Megrahi and Al-amin Khalifa Fimah. At the Zeist trial in 2001, Fimah was found NOT guilty but Megrahi was found guilty. During the indictment speech, Mueller explained the importance of PT/35(b), a small fragment of a circuit timer that was allegedly found among the debris of Pan Am 103 near the town of Lockerbie. Today, we know that PT/35(b) is a forgery. We also know that at least one witness was well aware that PT/35(b) could not have been part of the MST-13 timers delivered to Libya and that this witness deliberately withheld this information from the court. Following submission of the Police Report (section 30.0 dealing with PT/35b to the Crown), it was requested that certain further tests which had earlier been carried out on the fragment also be performed on the control sample [ DP/347(a)] of MST-13 circuit board. Five tests were carried out in the period from 28 February 1992 to 6 March 1992. The conclusion of the report states that none of the scientists would say conclusively that PT/35(b) and DP/347(a) were specifically the same material or from the same source. In fact, all these scientists had pointed out correctly various methods to establish that PT/35(b) was NOT similar to the control sample of the timers delivered to Libya. At that point in time, it would have been scientifically straightforward to demonstrate that PT/35(b) — the key piece of evidence linking Libya to Lockerbie — was a forgery. But nothing was done and a few weeks later — on 31 March 1992 — the UN Security Council passed resolution 748 imposing mandatory sanctions on Libya for failing to hand over Megrahi and Fhimah. The 2001 anthrax attacks, also known as Amerithrax from its Federal Bureau of Investigation (FBI) case name, occurred within the United States over the course of several weeks beginning on September 18, 2001, one week after the September 11 attacks. Letters containing anthrax spores were mailed to several news media offices and two Democratic U.S. Senators (Tom Daschle and Patrick Leahy), killing 5 people and infecting 17 others. According to the FBI, the ensuing investigation became “one of the largest and most complex in the history of law enforcement”. On August 6, 2008, based on DNA evidence leading to an anthrax vial in Ivins’s lab, federal prosecutors declared Ivins to be the sole culprit of the crime. Two days later, Senator Chuck Grassley and Rep. Rush Holt called for hearings into the DOJ and FBI’s handling of the investigation. On February 19, 2010, the FBI formally closed its investigation. In 2008, the FBI requested a review of the scientific methods used in their investigation from the National Academy of Sciences, which released their findings in the 2011 report Review of the Scientific Approaches Used During the FBI’s Investigation of the 2001 Anthrax Letters. The report cast doubt on the U.S. government’s conclusion that Ivins was the perpetrator, finding that although the type of anthrax used in the letters was correctly identified as the Ames strain of the bacterium, there was insufficient scientific evidence for the FBI’s assertion that it originated from Ivins’s laboratory. Mueller starts his ‘investigation’ with a script acceptable to his masters and his villains among America’s favourites. Mueller does not allow his people to investigate. He expects them to find ‘evidence’ to back up his story. He then builds very circumstantial cases against minor actors, often based on the testimony of well rewarded — and not credible — snitches while at the same time ignoring hard and undisputable scientific facts. Whenever he manages to get an indictment in a kangaroo court, he then parades on the media to explain that more people, including the top dog, are guilty. In this video, you can hear Mueller explaining that the Lockerbie bombing was a well executed operation. According to the indictment, an unaccompanied luggage contained the bomb that destroyed the plane. The luggage ended ‘by pure luck’ at the very weakest location on the plane. Terrorists would have had ZERO control over that parameter. So, how does this qualify for a well-planned operation? Wisdom of the Crowd — Can you help? The picture at the top of this post was extracted from the following video. I would like very much to have a copy of Mueller’s presentation during the indictment. I want to hear what he said about PT/35(b). I will explain in great details why we know that this fragment is a forgery. PS: You may have noticed that William Webster came to the rescue of Robert Mueller in an opinion piece published by the NYT. That is almost funny. Webster was Director of the Federal Bureau of Investigation (FBI) from 1978 to 1987, and then Director of Central Intelligence (CIA) from 1987 to 1991—the only person to have held both these positions. Both appointments were intended to recover a bit of credibility following major scandals: Watergate and the Iran-Contra affair. Thus, Webster was the CIA boss during the Lockerbie investigation. My research led me to believe that the CIA, and only the CIA, had the means, motive, and opportunity to fabricate and plant PT/35(b) among the debris of Pan Am 103. This entry was posted in Robert Mueller and tagged Anthrax, CIA, FBI, Lockerbie, Robert Mueller, William Webster. Bookmark the permalink. 1 Response to The Dark Past of Special Prosecutor Robert Mueller — The Bulger Gang, Lockerbie, Anthrax… An Exceptional Failure All Round.